Pop the game disc into your DVD player and let the movie magic begin! Classic characters and unforgettable songs from your favorite Disney and Disney/Pixar scenes are now in a DVD game. Enjoy real movie clips from much loved films as you answer trivia questions and race around the game board! I love the way that they have made the Disney version very suitable for children. Both by allowing progress on the track without needing a correct answer every time and by having separate questions for children and adults. Actually, I'm not sure there is that much of a need to help the children, as mine are consistently winning! 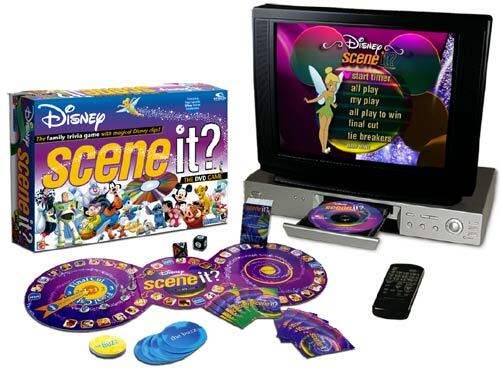 If your family love Disney, and want to play a game together this is a great one to have. We played it with ages from 12-50 and everyone was able to take part. There are even questions that are easier for younger kids.